System administrator usually has to protect corporate network from inside and outside threats and block them. To help administrators to deal with it, we created our product – StaffCounter DLP. What can it do? 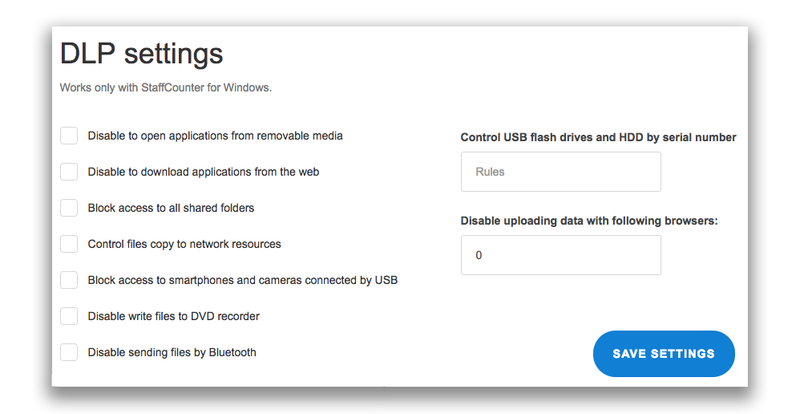 Ban downloaded applications or apps from removable media. After registration and setup StaffСounter agent for Windows open General Seetings and go to DLP Settings. Turn on the options you need. When do you need this protection? Do you know that user can make unintended harm to corporate device? Installing pirate software, running applications from e-mail attachments, unlimited downloads for personal use will produce a weak security in your company. Also insiders make great harm too. We created such functionality, that your corporate network will be in safety. All protection can be configured ot turned off only by user who has acces to Control Panel on StaffCounter. Other users (even with administrator rights) can not configure DLP.